Last year Oysterband Cellist and bass player Ray Cooper left the band and started his solo career with a fine album and a series of intimate and outstanding shows. We are delighted that Ray has decided to preview his new album ‘Palace of Tears’ with a concert in the historic St Peter’s Church. It is going to be a very special night with visitors from far and wide. This will be a chance to buy a special signed pre-release copy which will only be available at this show in the UK. “Like Ennio Morricone galloping through the brooding grandeur of the Nordic forests with a trusty cello as sword and emblem. Compelling stuff” fROOTS magazine. Known as ‘Chopper’ of Oysterband fame for many years, Ray took the step to leave the band in February 2013 at the peak of their success following ‘Ragged Kingdom’, the award winning album with June Tabor, . Why leave? “I want to sing”he said simply, “to play my own songs and see where it leads. It has already been an adventure, and I know there are more to come”. Since February, Ray has been enjoying a busy touring life, with concert tours in 2013 of England, Germany, Denmark, Sweden, Germany (again), Belgium and Holland. 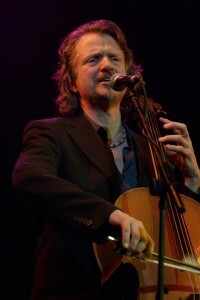 Previously, Ray has made solo festival appearances at the Shrewsbury Folk Festival, Sidmouth and The Big Session. Ray is at home on stages of any size. He sings and plays cello, guitar and harmonica. He recently started also playing piano at shows. While on tour, Ray also fits in House Concerts and has particularly enjoyed playing unplugged in castles.